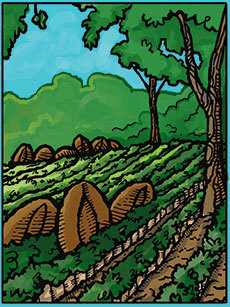 Costa Rica Hacienda Miramonte Coffee - Zingerman's Reserve for sale. Buy online at Zingerman's Mail Order. Gourmet Gifts. Food Gifts. Hacienda Miramonte is located in the canton (“county”) of Naranjo in Costa Rica’s Central Valley. The farm was started in 1917 by the matriarch of the Gurdian family, Lucila Duval de Morales, and is now operated by her great-grandson, Ricardo Gurdian. Steve Mangigian, partner and head roastmaster at Zingerman's Coffee Company, has developed a strong relationship with the Gurdians over the last several years that led to the development of the Zingerman's Reserve Hacienda Miramonte coffee. At the peak of the season, the most experienced coffee pickers go out into the groves to pick the ripest, most perfect cherries. After seeing harvest, Steve remarked, "Never before had I seen such uniformity in the selection and picking process." But the selection doesn't stop there. Most of the coffee produced by Hacienda Miramonte is processed at a nearby facility, but to ensure that these ultra ripe cherries don't get mixed in with the rest of the crop these cherries are processed right on the estate. They're processed using two methods: natural processing and pure honey processing. Nearly all coffee beans are stripped of the coffee cherry fruit that surrounds them before fermenting and drying, but the honey and natural processes both leave some or all of the sticky, sugary fruit on the bean during the fermentation. Leaving it the fruit intact during the fermentation creates fruity, acidic notes and smooth, velvety textures in the coffee. When you brew it, the flavor is marked by an incredible sweetness and juiciness. After the coffee is processed, Steve and his crew tasted each of the individual lots of the harvest and chose the very best tasting lots to include in the Zingerman's reserve. The result is phenomenal: a coffee that has a rich, cocoa sweetness balanced with plenty of bright, fruity notes. An outstanding brew. Tasting Notes: cocoa-like sweetness with flavors of caramel and citrus. Smooth, clean body. Superbly well balanced.